Lazy Lagoon and Sunny Steps are just two of the new areas to explore. Season 8 has arrived and a monstrous volcano has appeared! Freed from the Ice King’s castle, the now-powerful Prisoner has brought fire and flame to Fortnite and its islands. Pirates, Ninjas and a ship load of new fighters will tussle over treasure, battle with Pirate Cannons and uncover legendary loot. For those daring enough to explore, the new Lazy Lagoon and Sunny Steps locations are just a jump away with the help of Volcanic Vents. There are tons of new areas to explore and secrets to uncover. This season, X marks the spot! New to Season 8: Party Assist! Before a match, you can pick a Daily or Weekly challenge and get assistance from your friends to help you complete it! Team up with a friend to complete these new social challenges together. A new season also means a brand-new Battle Pass. Over 100 new exclusive rewards are ready for you to unlock, and it still costs the same 950 V-bucks. This season, you get the Blackheart and Hybrid progressive outfits instantly when you purchase the Battle Pass, both of which can level up to unlock new styles. For everyone that completed the 13 free Overtime Challenges during the Share the Love event, you can claim your free Season 8 Battle Pass at the Battle Pass tab or upgrade to a Battle Bundle at a discount. 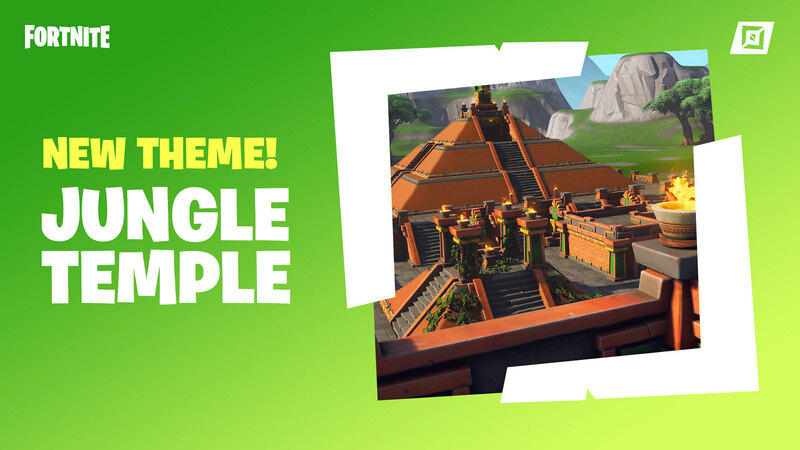 Set up deadly traps or harrowing trials in your own adventure games using the new Jungle Temple Prefab and Pinball Bumpers, exclusive to Fortnite Creative. Play your way with the new Hero Loadout overhaul! Customize your playstyle by mixing-and-matching new and unique perks for each Hero. Choose a Commander, five Support Team members, and one team perk to tailor the way you play. Eight new, unique quests have also been added to the game, each unlocking a new Hero to add to your roster! More Heroes, more combos. Build your customized team, save your favorite presets, and prepare to Save the World.